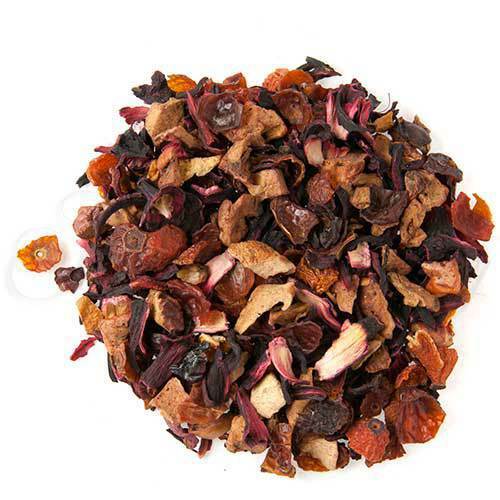 This herb and fruit tea has a bold, bright, peach and fruit flavor, slightly tart with some natural sweetness.. Combines hibiscus petals, rosehip, apple pieces and orange pieces for a unique caffeine-free infusion. Cup Characteristics: Bold, bright, peach and fruit, slightly tart with some natural sweetness. Luxury Ingredients: Hibiscus petals, Rosehip & Apple & Orange pieces, and Natural flavors. Herb and fruit tea in some circles is considered a new type of tea. We formulated this blend to accommodate tastes of people who wanted to experience a refreshing healthy new style drink without caffeine. What we got was a terrific ‘tea’ that is unbelievably delicious and enjoyed Hot or Cold! This tea has a very exotic flavor profile. The delicious blend of peach and fruit flavors combined with the natural flavors and tartness of the various dried fruits create a summertime cooler or a wintertime summer reminder. During May the Niagara Peninsula in Canada is ablaze with color from the blossoms of the soft fruit trees. A large percentage of the trees are peach trees and by end of July these delicate blossoms manifest themselves into large, soft, juice running down your chin yellow peaches. This fruit and herb tea has a flavoring that is reminiscent of these peaches – perhaps a little more full bodied and fruity but still has the wonderful tones of Niagara Peninsula peaches. For a summer time drink Paradiso Peach iced is hard to beat. It is refreshing and thirst quenching and not overly sweet. For formal times garnish the glass with a slice of peach and a sprig of mint – for non-formal times pour it into your glass and enjoy it gulp after gulp! If you have small children use the Paradiso Peach tea to make popsicles – they taste great and contain very little sugar.